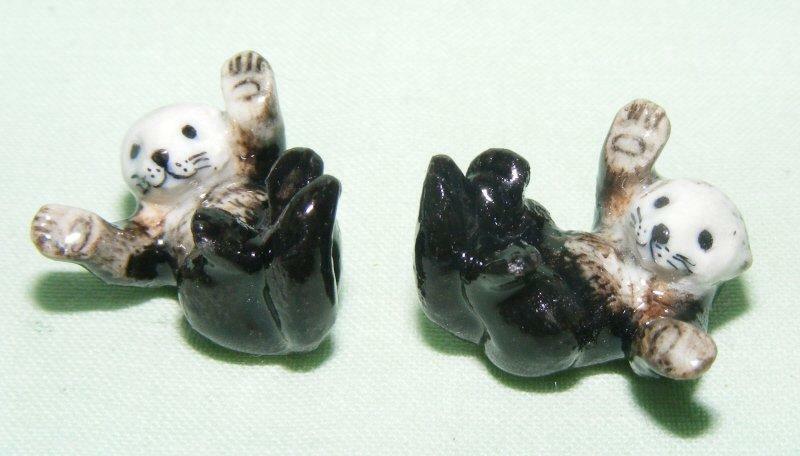 This exquisite pair of tiny wee sea otters is from the Northern Rose Super Minis series. They each measure approximately 1.2 cm high by 2 cm wide (about 0.5 x 0.75 inches) and will make an excellent addition to any collection of miniature animals. Popularly known as the "Rose of the North", Chiang Mai in Thailand is blessed with stunning natural beauty and is a major centre for fine porcelain and quality handicrafts. Each charming figure in the Northern Rose collection is designed with a touch of whimsy by talented artisans and is individually hand painted. Here at Jackie's Attic, we are proud to bring the superb range of Northern Rose miniatures to the UK. The quality and attention to detail of these little figures is absolutely stunning! Payment to be received within 7 days, please, unless other arrangements are made with us before purchase. We prefer payment via PayPal, but also accept personal cheques or postal orders. If an item is damaged in transit, please contact us and we will replace it or give you a full refund. We would appreciate either the return of the item or a photo of the damage, to support any claim we may make against the carrier. If you purchase an item from us, you have the right to cancel the transaction. If you wish to do this, please e-mail us at the latest 30 days after you have received the item. We will give a full refund of the cost of the item, but you will be responsible for the cost of returning the item to us.